The Latitude Diamaris * is a high performance 4x4 tyre and is the original equipment for a number of high end 4x4 vehicles includig the Audi Q5 and Ranger Rovers. 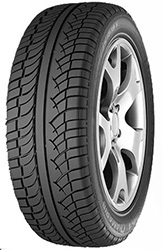 This particular Michelin Latitude Diamaris * is recommended by BMW but can also be used on a range of other high performance 4x4's vehicles focused on dry handling and reducing rolling resistence in this tyre in order to reduce fuel consumption. The Latitude Diamaris has excellent handling on both wet and dry surfaces.